The seventh ancestor in my 52 Week Challenge is my paternal great-great-grandfather, Joseph TROKA (pronounced like Truck-a). Joseph Troka and his wife, Clara in 1944. Joseph was born on 17 November 1871 in the town of Lipusz located in modern day Kościerzyna County, Pomeranian Voivodeship, Poland. His parents are listed as Michael & Joslyna (GRABOWSKA) TROKA. He is listed as immigrating to the Milwaukee, Wisconsin are in about 1889. It is not yet known if he traveled alone, or with family, as there are other Troka families in Milwaukee that are more than likely related to Joseph. On 29 January 1894, Joseph married the daughter of Ignatz & Nepomuncena SZULTA named Clara. Ignatz was the 5th ancestor that I posted about. They were married at St. Hedwig’s Church on the east side of Milwaukee, which at the time was the go-to Polish church in the area. He started working as a tanner in the tannery industry in Milwaukee as a lot of the Polish immigrants did. By 1905, Joseph is listed as a Tavern Owner at a tavern on 28 Lee Street in Milwaukee, which was also his residence. Today, 28 Lee Street is now about 900 E. Meinecke Avenue and his tavern was probably located somewhere in this vicinity near the intersection with North Bremen St. He ran the tavern until somewhere around 1930. After that point he was listed as being a Treasurer for the Pulaski Building and Loan Association, a position he was said to hold until about 1960. 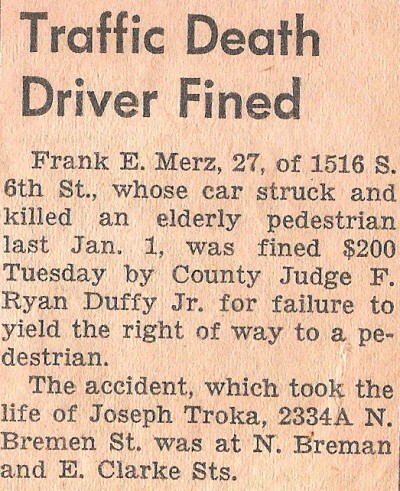 From the Milwaukee Journal, 1962. Joseph and Clara had 4 living children (4 died during or not long after birth) including my great-grandmother, Emily. In 1959, Clara passed away. Tragedy struck in 1962 when Joseph was walking from his home on Bremen Street a few blocks to St. Casimir’s church on the morning of Januray 1st. 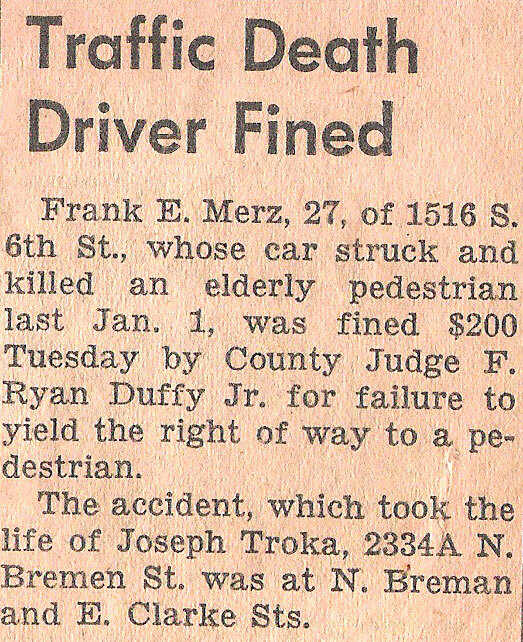 He was struck and killed by a man named Frank Merz , who was later only fined $200 for failure to yield the right of way to a pedestrian. Rumor has it that he was also drinking and driving. Joseph was 92. He was buried next to his wife at Holy Cross Cemetery in Milwaukee. 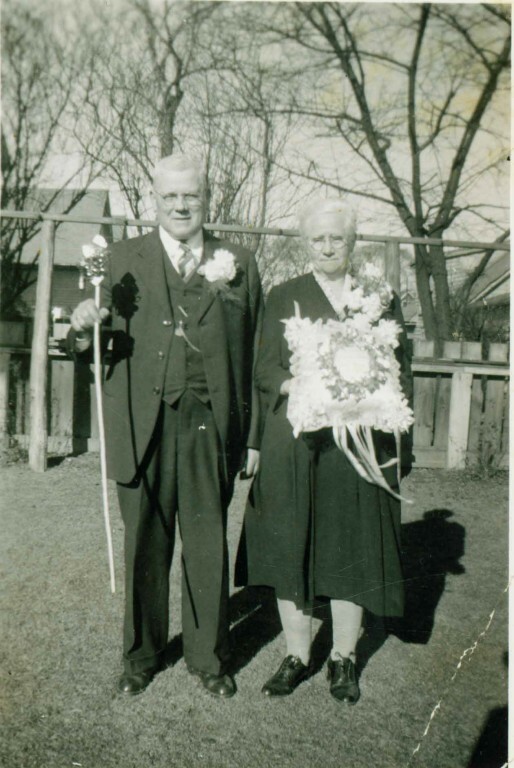 This post is 7 of 52 in the “52 Ancestors in 52 Weeks” Challenge” begun by Amy Johnson Crow. My ancestor post is a little late this week as we were on vacation this weekend. 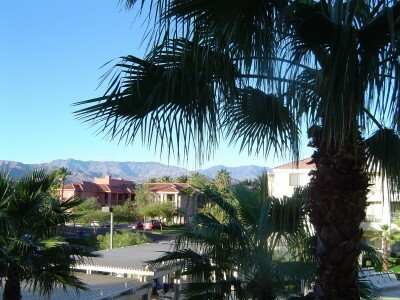 It was nice to escape the clutches of a winter that is hanging on a bit too long this year. The fifth ancestor on my 52 Week Ancestor challenge is Ignatz Peter SZULTA, pronounced like Schulta. Ignatz is my 3rd-great-grandfather on my father’s side. Ignatz was born on 30 January 1849 in a little town called Bukowa Góra in the what is today, Sulęczyno Parish, Kartuzy County, Pomorskie, Poland. According to his baptism, which was sent to me by another local Polish researcher, his parents were Anton & Marianna (MALSZYSKA) SZULTA. On 3 February 1875, he married Nepomuncena SYLDATK in the nearby Sulęczyno Parish. 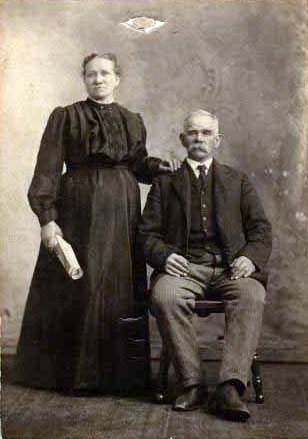 Their first child was my great-great-grandmother, Clara, born in 1876. They had two more children in Sulęczyno Parish before Ignatz emigrated to Milwaukee. He lived here a few years before Nepomuncena and the children traveled over, which was gleaned from the Milwaukee City directories at the time and the second passenger list that does not include Ignatz. When I was attending a local Polish researchers group, it turned out that Ignatz rented a house from one of the other researcher’s ancestors while he was living here on his own. Ignatz and Nepomuncena had 6 more children while living in Milwaukee. The photo at the top is the only photo I have of Ignatz and I need to find it again in my grandmother’s collection to rescan it. That is the highest quality I have. The photo seems normal, but I just don’t know why his wife looks to be carrying a rolled up newspaper. The only first-hand information I heard about Ignatz was from my grandmother, who never met him. She also wouldn’t have heard it from my grandfather, as he was only a year old when Ignatz died in 1922. I’m guessing maybe it was from my great-grandfather. She told me Ignatz was a mean, strict man, so I guess I can take that for what it’s worth. Ignatz passed away 25 May 1922 and is buried near most of my Polish ancestors in Holy Cross Cemetery in Milwaukee. 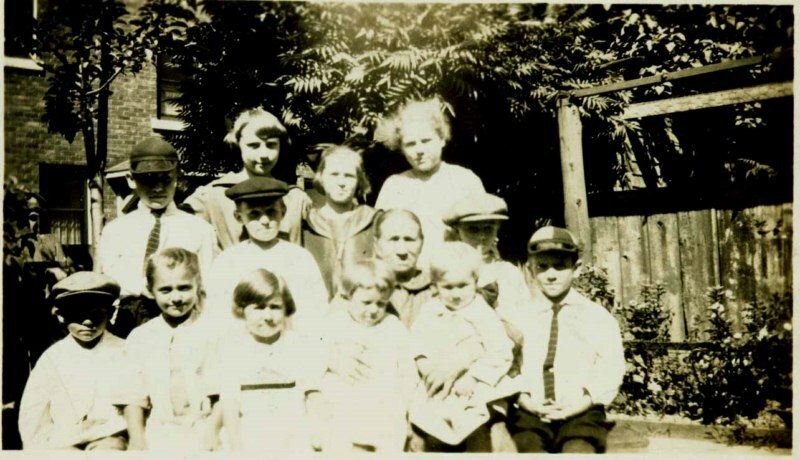 This post is 5 of 52 in the “52 Ancestors in 52 Weeks” Challenge” begun by Amy Johnson Crow. 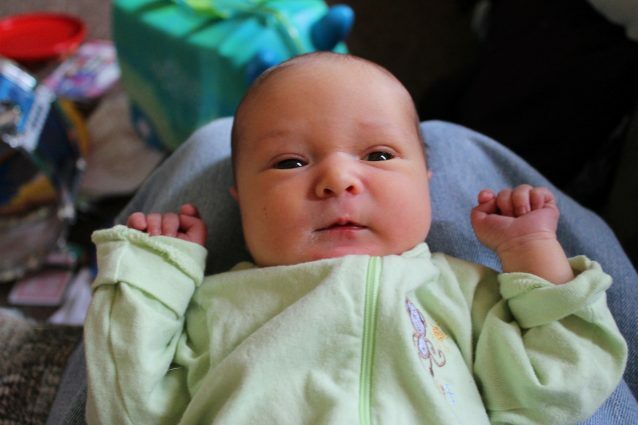 As I did with our daughter when she was born, I like to see which other ancestors or related individuals our newly born son, Xander, shares his birthday with on December 8th. According to the “Dates and Anniversaries” page on my family tree site, these things happened on December 8th. Johanna THOMPSON – 1852 – She is his paternal 5th great aunt, the daughter of William & Francis (QUINET) THOMPSON. Leocadia SZULTA – 1886 – His paternal 4th great aunt, daughter of Ignatz & Nepomuncena (SYLDAKT) SZULTA. Charles M LAST – 1894 – His paternal 3rd great uncle, son of Carl & Augusta (LUEDTKE) LAST. Elisabeth FLECK – 1769 – His maternal 7th great aunt, daughter of Johann & Elisabetha (UHL) FLECK. Mehitable NEWBURY – 1787 – His maternal 8th great grandmother, married to James ROGERS, III. Mary BOXALL & George VAUGHAN – 1639 – His maternal 11th great grandparents. Margaret CUTTS & Major William VAUGHAN – 1668 – His maternal 10th great grandparents. Major William is the son of Mary & George VAUGHAN from above. Sarah HAUGHTON & Joseph ROGERS – 1670 – His maternal 10th great grandparents. This week’s surname is from my paternal Polish ancestors. I’ve heard it pronounced both Troh-kuh and Truck-uh. The TROKA surname first shows up in my family tree with my great-grandmother, Emily (TROKA) ZALEWSKI. She was born in Milwaukee, Wisconsin in 1896. Her father, Joseph TROKA, was born in 1871. I have traced his birth to the Lipusz area of what was then West Prussia. It is now located in Kościerzyna County, Pomeranian Voivodeship, in northern Poland. He immigrated in about 1888 or 1889, either by himself or with his family. I have not tracked down his parents in the US, but have seen note of his brothers and sisters here. His parents are listed as Michael & Joslyna (GRABOWSKA) TROKA on his marriage certificate. Joseph married Clara SZULTA at St. Hedwig’s Church in Milwaukee in 1894. According to the map below, courtesy of World Family Names, the surname is most popular in the Polish county mentioned above, Kościerzyna. This is a photo from my paternal Milwaukee line. I don’t know the names of everyone in the photo, but there are a few I know. My great-grandmother, Emily (TROKA) ZALEWSKI, is at the top-left. Her mother, Clara (SZULTA) TROKA, is right below her. Clara’s mother (and my 3rd-great-grandmother), Nepomuncena (SYLDAKT) SZULTA, is to the right of her. The only other name I know is that of Nepomuncena’s son, John SZULTA, in the middle of the back row. The remaining people are either part of the SZULTA family or TROKA family. I have other photos from this day that include other family members. Click photo to enlarge. 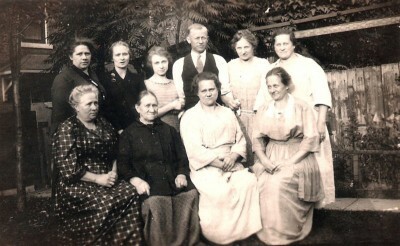 A photo from 1921 that includes my 3rd-great grandmother, Nepomuncena (SYLDATK) SZULTA, in the middle. This is a photo of her with a bunch of her grandchildren. 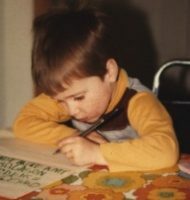 Since it seems to be sometime in Summer or Spring 1921, my grandfather would not have been born yet. Though, the little girl in her lap on the right looks an awful lot like my grandfather’s sister, Irene, who was born in 1920. The history for this week in my family tree. As always, you can find this on the Dates & Anniversaries page. Clara (Szulta) Troka and her daughters. 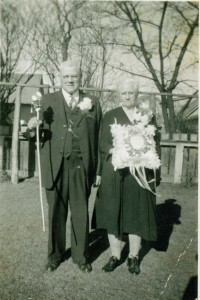 1959 – Died – Clara (SZULTA) TROKA – Clara is my great-great-grandmother on my father’s side. She was born 6 Jan 1876 in Sulęczyno Parish, Kartuzy County, Pomorskie, Poland. She immigrated with her mother and siblings in 1881 and met up with her father in Milwaukee, Wisconsin. He had come over earlier. She married Joseph TROKA in 1894 and had 4 children. She passed away in Milwaukee and is buried there with her husband at Holy Cross Cemetery. 1817 – Born – Charlotte (STRASSMAN) LAST – Charlotte is my 3rd-great-grandmother on my mother’s side. She was born somewhere in Germany and married her husband, Johann LAST, there before coming to Wisconsin in about 1857. Together, they had 4 children. She passed away on 20 Apr 1900 at Grafton, Ozaukee Co., Wisconsin and is (supposedly) buried at Union Cemetery in Port Washington, Wisconsin. I recently found her husband’s headstone, but have yet to find her’s as I talked about in a post. 1848 – Died – Charles PIETTE – Charles is my wife’s 5th-great-grandfather on her mother’s side. He was born 4 Mar 1773 in Malèves, Wallon Brabant, Belgium. In 1797, he married Marie RENIER and together they had 6 children. He passed away at Thorembais-les-Beguines, Brabant Wallon, Belgium. 1845 – Died – Leonardus CRAYBECK – Leonardus is my 5th-great-grandfather on my mother’s side. He was born on 25 Oct 1782 in Genk, Limburg, Belgium. He married Florentina Francisca KNUDDE in about 1812. They had 6 children including my ancestor, Jacobus KREBBEKX (not sure why the name changes.) He passed away at Hoofdplaat, Zeeland, Netherlands. My family history for this week. As always, you can find this information out at any time on the Dates & Anniversaries page. 1922 – Died – Ignatz Peter SZULTA – Ignatz is my 3rd-great-grandfather on my father’s side. He was born 30 Jan 1849 in Bukowa Góra, Sulęczyno Parish, Kartuzy County, Pomorskie, Poland, a small parish near Gdansk. In 1870, he married Nepomuncema SYLDAKT before emigrating to Wisconsin in about 1881. He passed away in Milwaukee and is buried there at Holy Cross Cemetery. 1770 – Died – Andreas UHL – Andreas is my wife’s 7th-great-grandfather on her father’s side. He was born in Rothenburg, Obdertauber, Bavaria. He married Elisabetha FABER in 1728. He passed away in Neipperg, Baden, Germany and is buried there. 1879 – Born – Mary (DAKINS) SHANNON – Mary is my wife’s great-great-grandmother on her mother’s side. She was born in Dayton, Waupaca Co., Wisconsin. In 1899, she married George W SHANNON and had one child, Marie R SHANNON. Mary suddenly died in 1904 in Keene, Portage Co., Wisconsin. 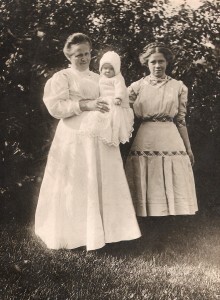 Little Marie was sent to live with Mary’s parents and George, it seems, went off to Colorado. 2006 – This is also our 4th wedding anniversary. 1842 – Born – Mary Jane (LINT) DIETER – Mary Jane is my wife’s 3rd-great-grandmother on her father’s side. She was born in Ohio. She married Frederick DIETER in 1868 in Fox Hollow, Wisconsin. They had 12 children including her ancestor Emma DIETER. She passed away on 20 Oct 1913 at Fox Hollow and is buried at Emmanuel Cemetery in Richland Co., Wisconsin. 1816 – Born – Nathaniel SHANNON – Nathaniel is my wife’s 3rd-great-grandfather on her father’s side. He was born in Gilmanton, Belknap Co., New Hampshire. He married Rosina ARNOLD in 1838. They had 8 children together, including the above-mentioned George W SHANNON. He passed away on 26 Oct 1878 in Stockton, Portage Co., Wisconsin and is buried nearby in Whiting.